The Police Transporter in GTA V.. 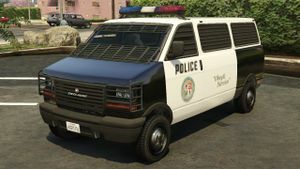 The Police Transporter is a Declasse Burrito modified for use by the Los Santos Police Department in Grand Theft Auto V. Except for a small portion of the windscreen, the van's windows are covered with armour plating. At wanted levels of 3 stars or higher, Police Transporters are used as roadblock vehicles, blocking one lane of traffic with the van and deploying a spike strip on the opposing lane. If the player drives past the van and spike strip, the van and its officer may join the pursuit. This page was last modified on 1 April 2014, at 05:08.